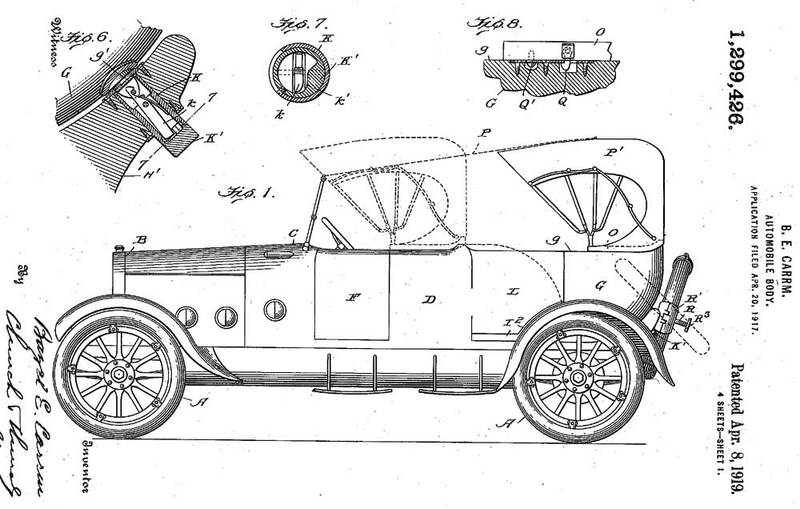 “Convertible-Convertible” is an unusual phrase, although that is precisely what Bazel E. Carrm’s cape-topped touring car coachwork he invented, constructed, and patented did. The bodywork could be changed from a five-passenger touring car into a two-passenger roadster in just the matter of a few minutes. The Argentian who emigrated to America and later became a US citizen applied for and was granted four US patents for his coachwork designs between 1917 to ’18. Two of his concepts are for touring car-roadster bodywork, and a third, an open-fronted limousine that converted into either a five-passenger touring car or a snug close-coupled enclosed car in short order. Two of the coachwork patents he assigned to himself and another pair to American Motors Inc., which may have been a company he formed on his own. A brief search for information about the Corporation was unsuccessful. At this point it appears that the complex designs, other than the one pictured may not have been constructed. 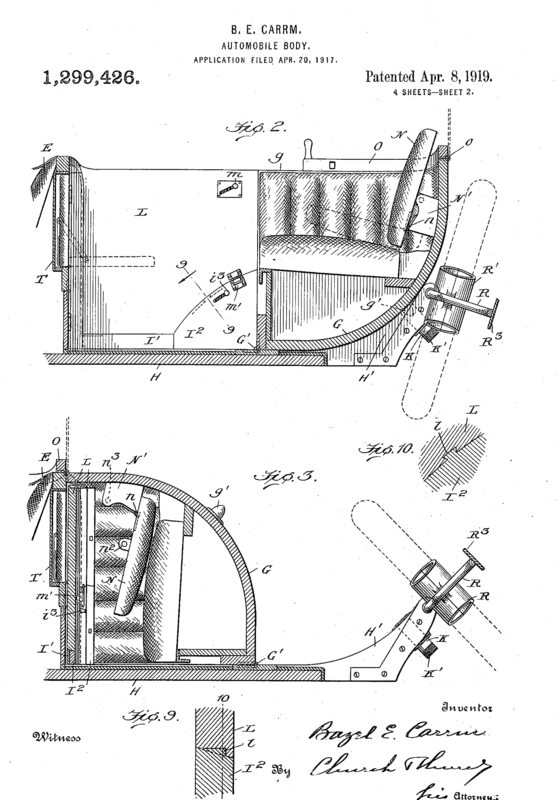 All of Carrm’s patents can be viewed here. Share with us what you find of interest in the photograph courtesy of the Free Library of Philadelphia and the patent drawings. Ed, Thanks for the kind words. You’ll find American Motors Inc. in the Standard Catalog as AMCO. The Amco automobile, an assembled car manufactured by the American Holding Co. / American Motors Inc., (100 Broad St., New York, New York ) for export only between 1919 and 1922. And then there was the Carrm Convertible Body Co. and Carrm Body Co.(Carmm Body Co., Carmm Convertible Body Co.), at 3251-53-55 Broadway, Corner 131st Street New York, that was formed to exploit the patents of Argentine born tailor turned inventor Bazel Eli Carrm, in some sources Basil E. Carmm. So that is why I could not find and info on it, thanks again Robbie! Great pics and good research. This is one of your best daily items in a long time, David! I second Ed’s kudos, enjoy and learn from this site daily even when I have nothing worthwhile to add. 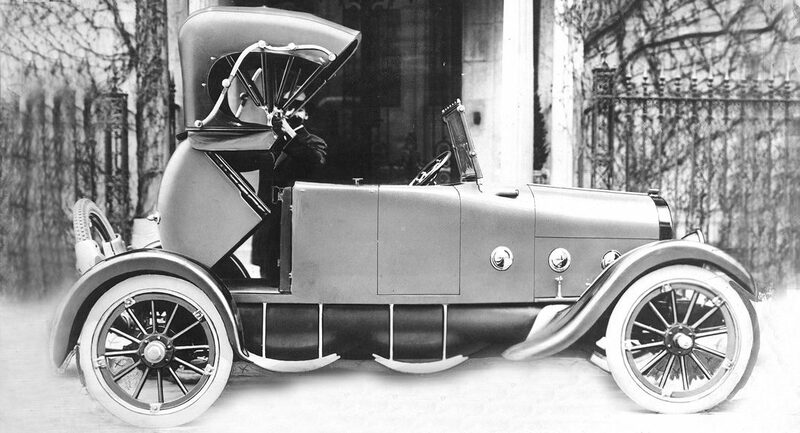 The many clever innovations that were developed in those early decades of the automobile are fascinating. It would be a worthy project for some to build this body on one of the many immediate post-WWI cars that exist in need of restoration. Absolutely. I’m often astonished and delighted by what I learn on this site. A fair amount of airbrushing appears to have been done to cleanup the shadows under the car and to make the body itself almost “too perfect.” Note the yet to be done areas marked with an “x” between the spokes of the rear wheel at 7 thru 10 o’clock as well as the front between 3 and 7 o’clock. I don’t think I’ve ever seen saddle shaped steps like that before. The plans show steps with only a slight curvature. I wonder if there was a reason or that was just a styling touch? It seems like if you placed your foot anywhere but dead center it could make mounting or dismounting a bit of an ankle twister.